Monday through Saturday 9:00 AM to dusk. Members and guests must sign in upon arrival. Membership badge must be worn and visible. 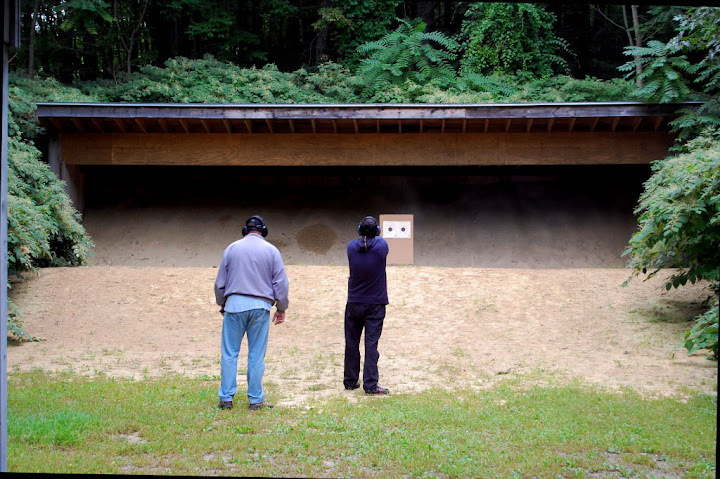 Always keep muzzle pointed down range in a safe position. Use proper eye and ear protection. Minors must be supervised by an adult. Guest may not shoot without their host member present. The ranges share a common firing line. No one is allowed beyond the firing line for any reason unless the line has been cleared, firearms unloaded, actions open and visible with shooters standing away from the firearms and benches. Dueling tree and three target flipper are the ONLY non paper targets allowed on this range. 25 foot target frames are the same as in the past. 50 foot target frames are smaller and are to be hung on the wire via the hooks on the back of the frame. NOTHING is to be placed on top of the berm. Always police the area when finished. A new area on the club grounds has been developed and designated for shotgun use only. This area will allow shot gunners to pattern their firearms or just practice with them in an area providing a safe backstop. The area is located at the rear right of the trap field. The area is closed during operating hours of the trap field. The trap field is also used by members shooting clays with a hand thrower. Both areas cannot be active at the same time. If two parties are at the field at the same time it must be used on a first come basis or a mutual arrangement between the two parties. Breakable target are allowed with some restrictions. No glass or fruits, vegetables or targets thrown into the air. Any and all debris must be picked up and disposed of properly. Only ammunition loaded with shot pellets is allowed. No slugs. Slugs are to be fired only at the Big Bore 25 & 100 yd. range. The shotgun area is new, it fills a gap and gives more diversity to our club. If you have any ideas to further improved the club and its ranges please bring them up to an RSO or the Board of Directors. The 100 yd. and 25 yd. ranges share a common firing line. All rifles except .50BMG are permitted. Shotguns firing rifled slugs or sabots are permitted. Paper targets only no metal or breakable targets. Targets must be mounted to target frames, no targets allowed on the ground.